It's that time again! Can you believe fall is only a couple weeks away? I'm beyond excited for this because I love the month of September, and there are so many exciting things happening this month. I'm so excited for fall especially since we're now living in Washington and I can't wait to experience the season here. 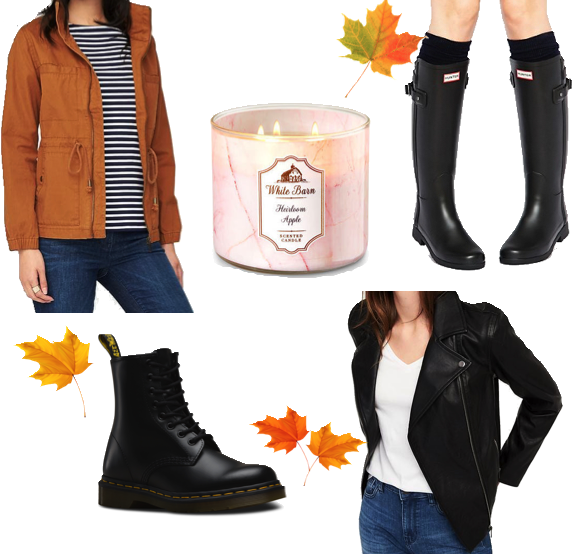 I gathered up some items that I've been wanting and that will be perfect for fall time in the PNW since the weather gets a lot colder up here. I suppose this can kind of also double as a birthday wish list since it is my birth month. Here we go! This coat from Old Navy is all sorts of perfection for the season. From its fall appropriate shade that I'm totally obsessed with, soft cozy material, and comfiness. Nothing makes it feel more like fall than candles from Bath & Body Works. I have quite a few favorite fall candles of theirs but Heirloom Apple is up high on my list. Can we also appreciate this packaging real quick? Since last year I have been wanting to get a pair of Hunter boots. Now that I live in a state that rains majority of the year they will come in handy. Plus, I can already see myself jumping in a puddle of water and even a pile of leaves with these booties. Another pair of boots that I have been wanting to own for some time now. I already have so many outfits planned with these boots and I'm also hoping these can keep out the cold from freezing my poor feet. I had been on the hunt for a nice black leather jacket since last year and I finally found one I love that is also from Old Navy. Have you noticed a pattern here? I'm definitely trying to get pieces of clothing to prepare myself for the colder months up ahead. What is on your fall wish list? Is fall also your favorite season? These are all perfect things for the fall. I just love that brown jacket, it's so cute! Me too the color is calling my name. I need to get me a pair of rain boots! Apparently the hunter ones are pretty good. I've been living all my life with wet shoes and socks when it rains, heh! The last time I owned rain boots was when I was a kid haha. It rains most of the year in Washington so its going to be a must. Yay Im glad to hear good things about Dr Martens. I own a few of their boots/sneakers style and love them. I've had my eye on this one for some time now. Sounds like I need to head over to Old Navy! I also been wanted an outdoor and leather jacket but that way my body is set up I cannot find one. So I'm starting my hunt again! & Happy Birthday Month! I'm obsessed with Old Navy! They've definitely stepped up their game in the last couple of weeks. I get majority of my clothes from there. Yes! Fall is definitely my favorite season! I love the color of that first Old Navy Jacket, it's perfect for Fall! Hunter boots are on my wishlist too. I think having a pair of black Dr. Martens is a must, I love wearing mine. They're really comfortable and are pretty good for the rain too. Old Navy has quite a few jackets that Im loving! I feel that I will definitely need Hunter and Dr Marten boots living here. I don't want my toes to freeze like when we visited in December. Every year I cannot help myself! I always want a new jacket! I also found a new leather jacket this year but from Urban. Its still too hot here in California to wear it, but I am counting down the days. I put some of my favorite pins on the lapel! Old Navy does have this suede motto jacket I have been eyeing as well. I have a feeling suede jackets are going to be the big thing this fall/winter! Recently me too! I never owned very warm jackets so as of the last couple of years its been a goal of mine to get more. In WA we are already getting chilly days and it feels so nice. I love the orange jacket! Usually I wouldn't wear orange but it looks absolutely perfect for fall! The last couple of years I've been really into rusty shades like that. Burnt orange, a rusty ochre, even mustard have me swooning especially for the fall! Ugh, I have wanted a pair of Hunter rain boots FOREVER! Maybe someday <3 Also, love Old Navy! I still want one so bad and I hope I can get them soon. It rains a lot in Seattle and more rain is coming this weekend. Most of my clothing is now from Old Navy haha. They have stepped up their game.